This year’s 46th Munich Security Conference is going to strike new topics and notes. Under the motto "No more excuses!" its organizer, Ambassador Wolfgang Ischinger, has again invited more than 300 high-ranking international participants to Munich to attend the most important annual global forum of foreign affairs and security policy. Aside from traditional topics of transatlantic and European security, the agenda includes for the first time issues of resource security and the global shift of powers. 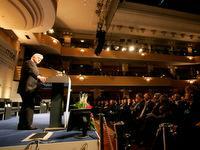 The Munich Security Conference is more and more focusing on global aspects. This is symbolized by the first appearance of China’s Foreign Minister Yang Jiechi who is going to hold the opening speech on Friday afternoon. Ischinger expects here "a presentation of the fundamental goals of Chinese foreign policy ". The willingness of China may be noticed "to deal with global issues more actively". In this context, Yang’s opening speech will also kick off a new series of topics of the conference. So he will discuss questions about resource security and the global shift of powers with, among others, the Azerbaijanian President lham Aliyev, the U.S. Deputy Secretary of State Jim Steinberg and high-ranking representatives of the economy such as RWE General Director Jürgen Großmann. According to the organizer, the effects of the economic and financial crisis as well as questions about resource security have significantly changed the genuine meaning of the term security. "Quite a number of foreign and security policy issues can no longer be resolved by foreign and security politicians alone but require economic-political expert knowledge to counter geo-political changes", Ischinger said. Two more main topics have been put on Saturday’s agenda in addition to the questions traditionally discussed in the conference about the transatlantic and European security architecture that will be mentioned in keynote addresses by the German Foreign Minister and Vice-Chancellor Guido Westerwelle as well as by his Russian counterpart Foreign Minister Sergey Lavrov and the High Representative of the Union for Foreign Affairs and Security Policy, Baroness Catherine Ashton, who is for the first time attending the conference. The security and stability in the Middle East as well as questions of disarmament, arms control and nuclear non-proliferation will be put on trial by, among others, the Russian First Deputy Prime Minister Sergej Ivanov, the Turkish Minister of Foreign Affairs Ahmet Davutoglu and U.S. Senator John Kerry. So not only new impulses regarding the obviously imminent signing of the American-Russian Strategic Arms Reduction Treaty (START II) may be expected. The new Director General of the International Atomic Energy Organization (IAEO), Yukiya Amano, attends the conference for the first time and in this context primarily the present movement of Iran in the nuclear dispute will give rise to intensive discussions. Not until a few days ago, Teheran declared to be willing to have foreign countries enrich Iranian uranium for the operation of nuclear plants. The surprising participation at short notice of the Iranian Foreign Minister Manutschehr Mottaki in the Munich Security Conference might shed further light on whether or not Iran will be able to credibly state its intention of pursuing an own nuclear program for peaceful purposes only. As a whole, the political bar has been raised high this year. Ischinger wants to draw a first balance. Since the initiation of the "political springtime" last year, the pressure arising from expectations on the responsible players in the international foreign and security policy has been intensified in the last few months in many areas from Afghanistan and the Middle East to the topics of disarmament and nuclear non-proliferation. "The proclamations of last year must now be followed by actions – no more excuses! ", Ischinger pointed out. The new development in the dispute about the Iranian nuclear program also raises the question whether last year’s offer formulated by the USA to Teheran to have "their hand put forth for reconciliation” will now be taken up by Mottaki. There would be an opportunity for a first dialogue: Traditionally, a rather large delegation from the United States will again arrive in Munich. In addition to Mr Steinberg, it will again consist of high-ranking representatives such as the former U.S. presidential candidates and senators John McCain, Joseph Lieberman and John Kerry and the U.S. National Security Advisor General James Jones. Under the motto "No more excuses!" the further debate will once more center around the future of Afghanistan and further international commitments there. The political confessions of the London Afghanistan-Conference which provide for a "strategic recommencement" by starting the redeployment of the Western military from the Hindu Kush while at the same time conferring further responsibilities on the Afghan government are now calling for concrete implementation plans. Here the speech of Afghanistan’s President Hamid Karzai on Sunday is greatly expected. His government intends to take over full control over the country by 2014. Among others, Great Britain’s Defense Secretary Bob Ainsworth, Pakistan’s Minister of State Nawabzada Khan and the U.S. Special Envoy to Pakistan and Afghanistan, Richard Holbrooke, will discuss solutions and regional approaches with him. The last conference day will start with NATO-General Secretary Anders Fogh Rasmussen and the German Federal Defense Minister Karl-Theodor zu Guttenberg giving principal speeches about the future strategic concept of NATO. Munich as security policy’s "crystallization point"
Owing to its worldwide recognized reputation the Munich Security Conference is more and more developing into a "crystallization point" of security policy. "A great number of security-political events such as the Nuclear Threat Initiative for nuclear disarmament, founded by the former U.S. Senator Sam Nunn, will this year surround the conference," the organizer states with delight. With the concurrent meeting of the Munich Young Leaders, organized for the second time, Ischinger will additionally adhere to his idea of rejuvenating the Munich Security Conference. Newcomers in foreign and security policy should be provided with a platform to contribute new impulses to the security-political discourse. The Ewald-von-Kleist Prize of the Munich Security Conference will also be awarded for the second time. It is supposed to honor leading personalities of foreign and security policy who have committed themselves in an outstanding manner to the international peace and to conflict management. The prize winner of this year is the former EU Envoy and former NATO General Secretary Javier Solana. The tribute to Solana also underlines the creed of the Munich Security Conference. "It is a central place to deal with strategies of conflict prevention and conflict resolution ", Ambassador Ischinger explains. Also this 46th Munich Security Conference should trigger decisive impulses for the implementation of these strategies. "2010 shall be a year of actions", Wolfgang Ischinger sincerely hopes.